US energy stocks dropped sharply on Monday as West Texas Intermediate (WTI) fell below $50 per barrel for the first time since 2009. 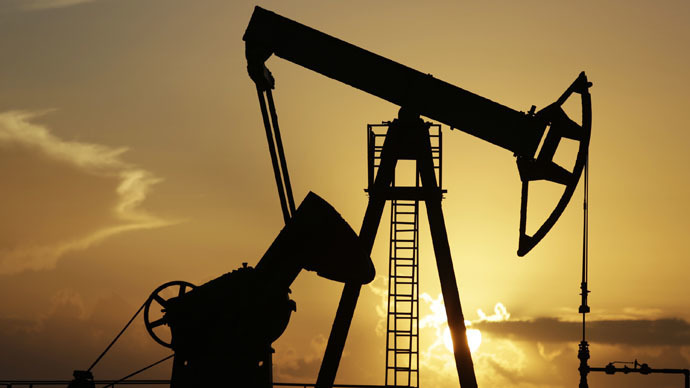 Brent crude oil has tumbled to $53 at the New York Mercantile Exchange (NYMEX). WTI crude February futures fell by nearly 5 percent briefly falling to $49.95 a barrel in New York on Monday morning. It’s the lowest in more than five and a half years. Brent crude hit its multi-year low dropping to $52.90 a barrel. Brent February futures fell by over 6 percent. Earlier, the European benchmark for Brent oil for February delivery dropped to $54.72 a barrel on the ICE Futures Europe exchange in London, Bloomberg reported. It’s the lowest for Brent crude since May 2009. By the end of 2014 Brent futures fell by 48 percent. Monday’s opening session of year also began with a disappointing decline. February futures on ICE Futures Exchange slid as much as 2.8 percent extending a loss of 5.1 percent since last week. The slumping oil prices come amid slackened global demand while supplies still remain high. Oil production in Russia and Iraq surged to the highest level in decades. Iraq exported 2.94 million barrels a day in December which is the highest since the 1980s, Asim Jihad, a spokesman at the Oil Ministry in Baghdad told Bloomberg on Sunday. In addition, the Iraqi Oil Ministry said on Sunday that it plans to increase crude exports to a record in January. Iraq is the second-largest producer in the Organization of Petroleum Exporting Countries (OPEC). Russian oil production rose 0.3 percent in December reaching 10.667 million barrels a day, according to preliminary data published CDU-TEK, an Energy Ministry branch on Friday. Production rose 0.7 percent in 2014 and averaged 10.58 million barrels a day, which set a post-Soviet record. As the prices of crude dropped, the Russian currency weakened against the US dollar going down to 59,34 at the opening of 2015 trading on the Moscow Exchange. The euro at this time traded at 71.95 rubles. Meanwhile, in December United Arab Emirates Energy Minister Suhail Al-Mazrouei said OPEC will maintain output at 30 million barrels of oil a day, as it was decided at the group’s last meeting in November. He added that before even considering a meeting about possible production cuts OPEC wants to monitor the price for three months.